Finding a way to get customers to stick to a single streaming media service is always tricky business for a company. With that being said, the battle for hardware space in your living room has been heating up recently, and Amazon is ready to throw its hat in the ring. Latest reports show that Amazon’s event next week in New York City is centered around a new web-to-TV streaming box. An invite is making the rounds to news sites, inviting reporters to an event on April 2 that starts at 11AM. That is next Wednesday in case you don’t have your calendar within arms reach. 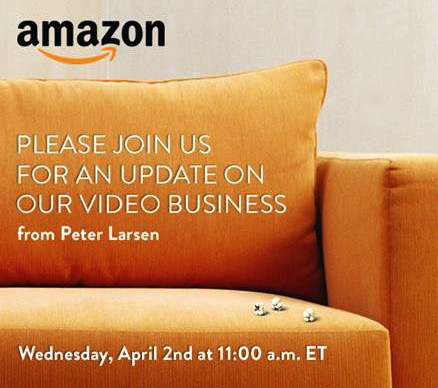 The invite offers people to get an update on Amazon’s video business from Peter Larsen himself. Rumors going around say that we will finally get to see Amazon’s delayed media streaming device. We are expecting to see a heavily forked version of Android powering this device, and you can expect a lot of talk about Amazon Prime considering its recent price increase. Amazon Prime owners, does this news interest you at all? Update: The Wall Street Journal is reporting that the video service that will be announced next week by Amazon will be a free-to-use video service. This is quite different from Amazon’s current video plans, which require a paid Amazon Prime subscription. The WSJ says this new service will be ad-supported to keep it free, and that it will feature lots of original programming. The report also suspects Amazon is to announce a set-top box alongside this new service.